A few weeks ago I turned 40. And ran a half marathon on my birthday. Through Disneyland. With my twin sister. It was her first one. What could be better?!?! It was honestly my best birthday ever. #1 I have never run a half marathon on my birthday. #2 I haven’t spent my birthday with my twin since our 30th. #3 My dad surprised me and came out to to visit from Ohio! #4 I got to spend my birthday at my favorite place, Disneyland!!!! As soon as I got my sis to agree to a half marathon with me I KNEW it would be special. 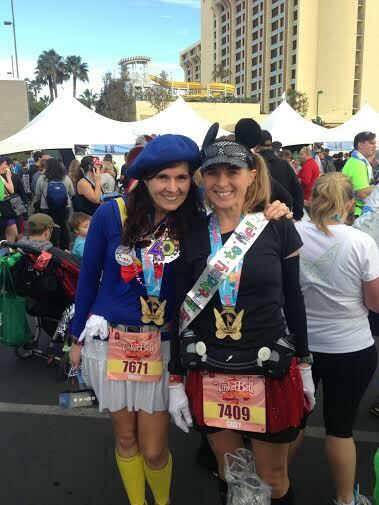 Especially since it would be her first runDisney race too! AND our 40th birthday? C’mon, how often does THAT happen?!? I started off my race weekend as Princess Leia, running the Tinker Bell 10k with my husband, who was Han Solo. We got a lot of compliments from the Cast Members. We got some awesome pics in front of the Castle and with some characters. My favorite was the girls from The Haunted Mansion. They looked EXACTLY like the images from the Stretching Room and sounded and acted like them too! Then, after the race, we checked into our hotel (only a few miles away from our house, lol) and my DAD showed up, surprising me with a visit from OHIO!!!! My husband and dad has been texting all week long about him coming to visit. What a great surprise!! Sunday morning greeted me with a 3am wake up call. Time for me to transform into Mickey and my twin as Donald (I made her costume for her). I wanted her to be her favorite Disney character for her first runDisney race, just as I was for mine last year (Goofy). We got to our corral and we were off. We ran right past my hotel too, so my husband, son and dad were able to cheer us on! We made friends with our Clif Bar pace runner, Mike, and were able to meet up with him at mile 13. He was so cool to get to know and talk to throughout the race. I’m glad that I was able to find him on Facebook. At the end of the race, my sister said “So that’s it?! ?” (haha). I was so proud of her. After making it through the finish line crowd, I heard someone calling my name. Throughout the race, I was giving my co-workers updates as to when we would finish. Little did I know, they had a birthday surprise waiting for us. A donut cake, birthday sash, pin and a bunch of strangers singing “happy birthday” to us. What a wonderful surprise. A special thanks to the girls of Sparkle Athletic for making my 40th extra special. The next day I got to visit more with my sister and dad and we had some yummy breakfast birthday cake. After that, the clock struck midnight and my sister had to leave. The next day my dad left. I want to be 40 all over again. The consolation? I’m running with my sister for her second half marathon in 2 weeks and I even got my husband to sign up for one.